When most people start fasting, there is typically some level of discomfort. However, it is possible to get used to the fasting routine pretty quickly. Quite simply, you must learn to fast in a way that works for you. While any true fast does involve abstinence from food or at least certain types of food, typically, different fasting combinations work better for different people. The goal to having a successful fast is all about finding what we like to call your Fast Zone. That is different for everybody and can change depending on the season you are in. The best way to describe your Fast Zone is that it’s the place where your mind is easily focused on God and spiritual things. You have an increased spiritual energy, you can feel the fast working. Just like runners know what their target heart rate is to see the benefits of their physical training, the Fast Zone is similar in a spiritual sense. Finding your Fast Zone helps you choose the type of fast. Let’s say you choose to go on a Daniel fast (only fruits and vegetables). Should you eat beans? If you can eat beans and stay in your Fast Zone, go ahead. But for some people eating beans takes them out of the zone. Should you eat peanut butter? Probably not. Peanut butter is more of an indulgence, and not many people can stay in a Fast Zone while enjoying indulgences. Should you completely cut out caffeine? It depends. The great thing is, when you fast, your body automatically craves less caffeine. If you can stay in your Fast Zone with a little caffeine, great. If you are going on a longer fast and want to cut it out of your diet completely, that’s great too. But ease yourself off and make it your goal to be completely caffeine free about two-thirds of the way into your fast. If you drink coffee regularly, one of the worst mistakes you can make is to fast for one to three days and cut caffeine out abruptly and completely. Please don’t do that or you will spend this time grumpy and in withdrawal instead of enjoying God’s presence. Mixing things up a bit during a twenty-one-day fast is what typically works best for people. For example, do a fruits and vegetables fast for a week. Then do all liquids for a while. Maybe even mix in a few days of only water if you think you are ready for that. Then go back to fruits and vegetables for a few days. There isn’t one approach that works the same for everyone. Follow the Holy Spirit, mix it up, find what works for you, and stay in your Fast Zone! With today’s protein drinks and juicing machines, it is so easy to get a healthy dose of all your nutritional needs even while taking in only liquids. Drink only liquids – especially water. On this type of fast you may also take in clear broth and 100 percent fruit and vegetable juices in order to maintain your strength. There are many options for partial fasts. The most frequently used example of a partial fast is found in Daniel chapter 10. The Daniel Fast is a fast from meats, sweets, breads and any drink, except water, for a specific time period (Daniel 10:2-3). The easiest way to think of this fast is eating only vegetables and fruits, and drinking only water. More detail on this fast below. -Giving up one meal a day for a specific amount of time, one meal a week, etc. -Fasting for a set time during the day. For instance, from 6:00am to 3:00pm or from sun-up to sundown. A juice fast is simply consuming vegetable and fruit juices and water instead of solid food. Many people include whey protein in their liquid plan as well. This is one of the most popular and effective fasts. Even if you choose not to make your entire fast liquids only, substituting one or two meals for liquids is a great alternative. 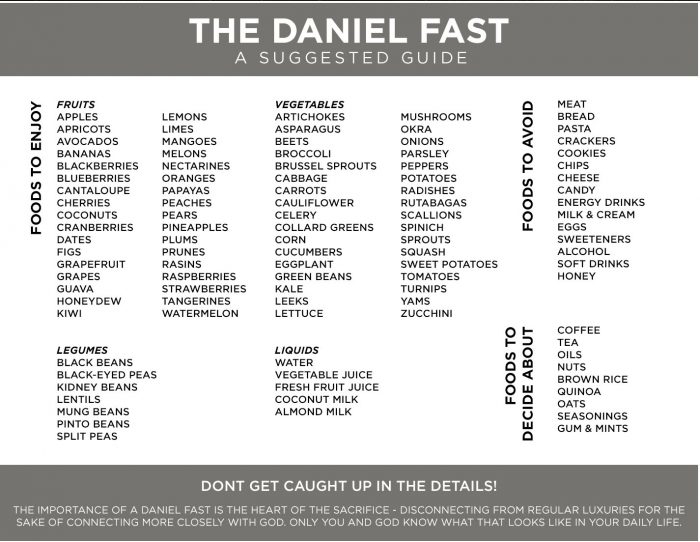 DANIEL FAST The Daniel fast is a great model to follow and one that is extremely effectivefor spiritual focus, bodily discipline, and purification of the body and soul. It is one of the most commonly referred-to fasts; however, within the Daniel fast there is room for broad interpretation. Daniel 1 states that he only ate vegetables and water, and in Daniel 10, while the passage does not give a specific list of foods that Daniel ate, it does state that he ate no rich (or choice) foods, as well as no meat or wine. So based on these two verses, we can see that either of these, orcombinations of the two, constitute a Daniel fast. It is important to reiterate that there is nothing inherently spiritual about one type of fast as opposed to another. Your goal should be to seek God in prayer about this and follow what the Holy Spirit leads you to do. Just remember: find your personal Fast Zone. What do i do during my fast? Our prayer for you over the twenty-one days is that your passion for God and His Word will be ignited, and that you will develop a hunger for His presence that is greater than ever before!